More than 500 residents of Yelahanka spent a few hours on Sunday 9th March 2014, learning how to grow vegetables and fruits at home, and in the process, manage their kitchen waste too. This was at the gardening and waste management training, organised by Yelahanka United Environment Association (YUVA) at Allasandra Lake park in Yelahanka New Town. The programme was conducted by the Department of Horticulture, Government of Karnataka under the Rashtriya Krishi Vikas Yojana scheme. Dr K. Ramakrishnappa, Additional Director of Horticulture, Govt of Karnataka spoke about the benefits of kitchen and terrace gardening. In this age of pesticide-driven agriculture, he said that many of the vegetables and fruits available in the market seem to add to human diseases and ill-health. To bypass the need to buy from the market, he explained how one could cultivate low cost, nutritive, organic vegetables and fruits using kitchen waste and plant remnants, with the efficient use of water. He went on to link gardening with waste management, explaining how home gardening would encourage urbanites to segregate kitchen waste and use it as manure for plants helping in effective management of garbage at source. Ms Pavithra, Sr. Asst. 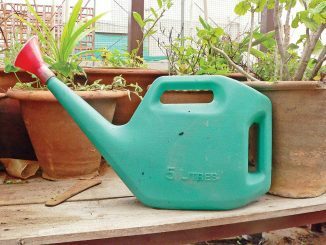 Director of Horticulture, Bangalore North, Yelahanka demonstrated how fresh organic vegetables can be grown at home utilizing minimum space in balconies, backyards or terraces using grow bags, pots or old buckets. She also explained the simple process of converting kitchen garbage into compost and how this would reduce the load on the city’s waste management system, apart from keeping the city clean. At the end of the three-hour programme, Dr Tayappa, the President of YUVA, complemented the Horticulture Department’s initiatives in conducting such training programmes. He also spoke about how “Gardening” is a healthy hobby that not only keeps one engaged for a few hours per week, but also gives the pleasure of being in the midst of a growing garden. He mentioned that YUVA would continue to facilitate conducting more such environmental programs for the benefit of local residents and the next step would be to take this to the schools and colleges in the locality. Thanks to Mr Jagadeesh Giri, Joint Secretary, YUVA for providing the information and pictures.